9 of 10: Lovely writing, better pacing, and a great set of characters, Fire left me such more more gratified than Graceling. Also I could not stop staring at the cover – it is gorgeous. Back in February, I read Graceling which has turned out to be quite a popular book, gathering awards and gushing reviews right and left. As I said in my review, I certainly enjoyed it, but a few things kept me from being able to throw it in my “favorite books” stack. As time passed and I read more reviews, I became increasingly skeptical about the book, and I wondered if I’d really end up reading Fire when it came out. So many books, so little time and all that. But then, the lovely folks at Penguin sent me an ARC copy of Fire and I took it on the plane trip to Boston. I read about half of it there, and then found myself loving the T and bus rides in Boston because it gave me a chance to finish it. I stayed up late reading it and when I wasn’t reading it, I was thinking about it. This book is so much better than Graceling. 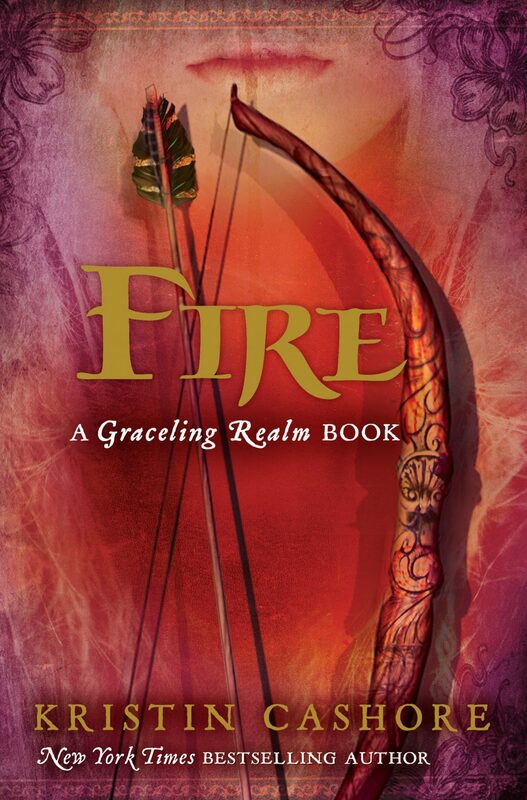 Fire is the prequel to Graceling and takes place about 30 years earlier in the Dells, a land across a crazy huge mountain range from the one that Graceling takes place in. The only crossover character is a boy with mismatched eyes and the disturbing ability to convince people to believe everything he says (if you’ve read Graceling, you already know it’s the future King Leck). In the Dells, there are no gracelings. Instead, in addition to the normal population, there are “monster” versions of nearly every animal out there. A “monster” version of an animal has brightly colored fur or hair (a lime green mouse, for instance, or a deep purple mountain lion) and a sense and taste for other monsters. Fire is a monster human, the last one left. Her hair is red (not like we think of redheads, but actual fire-hydrant red, mixed with pinks and oranges) and she has to keep her hair covered whenever she is outside to keep from being attacked by other monster animals. She also can read people’s minds and control them, convincing them to do or say or do what she wants. Like Graceling, the whole thing is political, too. The Dells are in major turmoil, most of it brought on by Fire’s monster father (now dead) who was the advisor to the king (also now dead) and convinced him to do all sorts of stupid things that nearly ruined the kingdom. The current king and his family are desperately trying to hold the kingdom together as it is threatened by other would-be rulers. The blurb on the back made it sound like Prince Brigan (the king’s brother and the commander of the military) was immune to her mind control powers, but I think that’s misleading. She can’t control someone’s mind if they have a strong mind and keep it closed, and Brigan appears to just have a very strong mind. There is SO much plot in this book, I could summarize just the basic outset of the book indefinitely, but there’s no point in that since Kristin Cashore is such a marvelous writer. Better to just leap into the book and trust her to make it worth reading. Kristin Cashore has the most fascinating mind, I think; these worlds she comes up with completely engulf me. Also, one of my complaints about Graceling was how uneven it felt to me – some parts were brilliant and fast-paced, while other parts dragged on and on. This book was much more even. It wasn’t quite as fast-paced as Graceling, but it definitely moves right along. I also deeply admire Kristin Cashore’s ability to lead you up to a vital plot point without you noticing – she’ll spring something on you and suddenly you realize that all the groundwork for this big reveal has been going on for hundreds of pages and you never even saw it coming (or maybe when I say “you,” I should say “me;” perhaps you are much brighter than I am, which wouldn’t surprise me in the least). Also, remember how at the end of Graceling, everyone is all “you call that an ending?” This book has more closure than that. Thank heavens. Finally, I absolutely loved Katsa and Po in Graceling and wondered if this book would even be worth reading since they aren’t in it. If you are worried about that too, I think you should rest assured that it’s not the case. I loved Fire quite a lot more than Katsa, and Brigan was a top-notch character too (different from Po, but maybe even better). The romance doesn’t play out as quickly as it did in Graceling (I thought the romance in Graceling happened too fast and then the book didn’t quite know what to do to keep the tension there), which I loved. Fair warning that this court is rather like King Henry VII’s court – there are a lot of love/lust affairs going on. It all pretty much takes place off-stage, but it’s definitely not a pre-teen kind of book. It’s a while until this one comes out, I know (October! ), and usually I would wait until it was closer to post about it, but I couldn’t put off sharing my thoughts on it any longer. There is no question in my mind – Kristin Cashore is a far better writer now than she was when she wrote Graceling, and Graceling was pretty darn good. This was cruel, of you – cruel to review it and make me wait so long to read it. Who knows when the library will get a copy. And will I remember to reserve it when it does? Glad you enjoyed it – I can't wait. I still have not read Graceling, despite having it in my library stack. Perhaps this weekend would be good, since I just finished up something else. I was planning to take a couple other books (ok, 4 other books. For a Friday night to Sunday afternoon trip on which I'm likely to have an hour to read) but I could slip this one in too in case it grabs me. Now that's just not right, giving out a bunch of information about a book that's not even available yet. I was on the fence about reading this too, but now I definitely will! Leck was a terrific character, I seriously got chills whenever he came on the scene in Graceling. I haven't read Graceling yet, though I've definitely seen all the praise it's getting. I loved your review of Fire, and I'm happy to hear it's even better! You know my address. Please send it my way 🙂 I know I have to wait in line. sold by amazon, and available for Free supersaver shipping. If you are still in TX and that book is just sitting somewhere….I would be more than happy to guarantee a 24 hour return policy! (I'm good at pulling all nighters…..)! I wanted to love Graceling but I, too, felt like the end was to…flat. However, I liked her writing style, so I'm excited to read Fire! Hmmmm…I wonder if we've ordered it yet?! ?